The number of American children enrolled in publicly funded preschools is growing—but states are spending less per child than they were 15 years ago, and the Trump Administration hopes to slash federal funding aimed at getting more disadvantaged kids into preschool. Public preschool programs have made major progress since Rutgers began tracking them in 2002. That year, there were 13 states that didn’t offer any public preschool—now there are just 7. These days, 16 states serve more than a third of their four-year-olds, up from just three states (plus DC) in 2002. 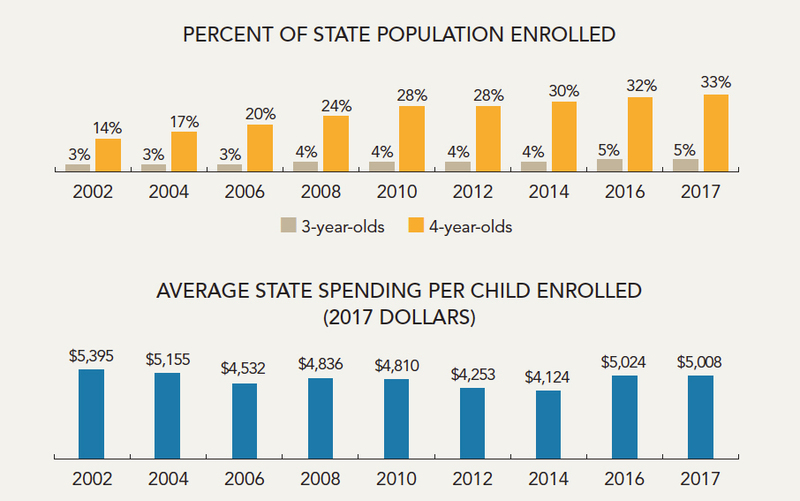 Over the same period, states have doubled their combined preschool expenditures to $7.6 billion. What’s more, the state spending varies dramatically: DC spends nearly $17,000 per child, for instance, while Nebraska spends less than $2,000. And seven states, of course, spend nothing. Per-child spending is an important figure because it correlates closely with quality, which the researchers measure with a system of 10 benchmarks—things like class size, student-teacher ratios, level of teacher training, and program oversight. The report found that only three states (Alabama, Michigan, and Rhode Island) met all 10 quality benchmarks. Eleven states met fewer than half. The federal government plays an important role in all of this. For one, it funds Head Start, the national preschool program that serves poor families. Barnett pointed out in a recent op-ed that the program’s budget was so small this year that Head Start had to scrap plans to make the school day longer. The Trump administration has proposed cutting Head Start even further. The federal government also administers the Preschool Development Grants Program, which last year contributed more than $230 million to state preschools—the Trump administration has proposed eliminating the program entirely. This money is especially important, Barnett points out, because it’s earmarked to increase preschool access for poor children. “That’s an incredibly important piece of this puzzle,” he says.